Last month, ongoing peace negotiations between the Taliban and the U.S. resulted in a tentative framework arrangement in which mainly the United States would withdraw its troops from Afghanistan in exchange for Taliban assurances that no other terrorist group, including al-Qaeda and the Islamic State (ISIS/ISIL), will use the South Asian country to plan and conduct attacks against the U.S. and its allies. U.S. President Donald Trump, during his State of the Union address last week, indicated he would be willing to withdraw from Afghanistan as part of a peace pact, but added that he would leave behind a residual American force in Afghanistan to carry out “counterterrorism” operations. As we make progress in these [peace] negotiations, we will be able to reduce our troop’s presence and focus on counterterrorism. … We do not know whether we will achieve an agreement, but we do know that, after two decades of war, the hour has come to at least try for peace. And the other side would like to do the same thing. It’s time. Days before his speech, Trump told CBS News he is considering leaving behind a smaller force to ensure the Taliban keeps its promise, echoing recent comments by CIA Director Gina Haspel that a “monitoring regime” would be necessary to bind the terrorist group to its pledge to prevent terrorist groups from using Afghanistan for international terrorism. 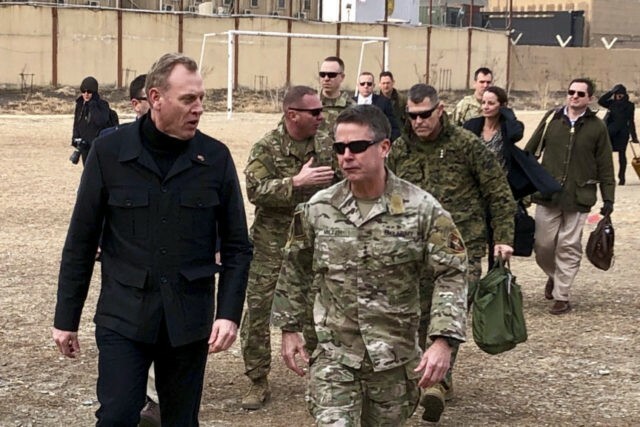 Secretary Shanahan, however, revealed that the White House has not ordered the Pentagon to withdraw any troops from Afghanistan. The Taliban’s refusal to allow Kabul to play a role in the ongoing negotiations is one of the top points of contention for negotiators. Shanahan emphasized the importance of including the Kabul in future talks. Trump’s lead negotiator Amb. Zalmay Khalilzad has indicated that a U.S.-Taliban deal is possible before Afghanistan’s presidential election in mid-July. Shanahan denied Taliban claims that peace negotiators are discussing the withdrawal of half of the 14,000 U.S. troops in Afghanistan. Citing the Afghan Defense Ministry, the Wall Street Journal (WSJ) reported that Shanahan also assured Kabul that the United States will not abandon the country’s struggling security forces, which still rely on American support despite billions of American taxpayer funds devoted to developing and training them. Gen. Joseph Votel, the American commander in charge of the Afghanistan theater, told lawmakers last week that the United States will have to continue funding the Afghan security forces post-withdrawal to the tune of hundreds of millions annually to ensure they keep the region, home to the highest concentration of terrorist groups in the world, safe. The Taliban claims the U.S. has “promised” to continue funding reconstruction efforts in Afghanistan. The Trump administration has intensified peace negotiations with the Taliban in recent months. “Political reconciliation” between Kabul and the Taliban is the primary goal of the Trump administration’s strategy to end the more than 17-year-old war.